Despite being only a matter of millimeters in size, an ulcer can be very uncomfortable in the mouth. Whilst they will normally go away naturally within a matter of days or weeks, the discomfort they cause can potentially be eased with a number of different products. I want to be clear from the outset. There is no one product or cure for mouth ulcers. The suggested products are designed primarily to assist with the most common aphthous ulcer. For most, these ease the pain or discomfort and help the ulcer heal faster. Let’s face it, it can be a few pounds well spent if the pain subsides! We’ll jump straight in with a quick list for the best mouthwash for ulcers, but we go into detail further down the page for those of you that want more info. The list below shows the products on Amazon, but we do recommend shopping around and checking out other retailers such as Boots and Superdrug. Mouthwash tends to be the more popular option for ulcers, but some people prefer gels. We recommend checking out the following. To better understand an ulcer and what you can do to help yourself, why not read on and learn more about how or why and ulcer forms and what steps you can take to treat it. An ulcer, or canker sore as it is otherwise known, is a painful sore that can be found anywhere within the mouth. It is a break in the continuous outer layer of your skin (or mucous membrane in the mouth). An ulcer can make eating, drinking and even talking uncomfortable. The most common is the aphthous ulcer and around 1 in 5 in the UK get them repeatedly. According to Kathryn Gilliam they occur most commonly in women, starting between 10 and 20 years old. The good news is that most clear up fairly quickly (1-2 weeks), with no need for medical treatment. A minor aphthous ulcer is usually small, round or oval and less than 1cm across. Not all that painful, they tend to be more uncomfortable than anything. You may even have up to 5 at one time. If they occur repeatedly, they may also known as recurrent aphthous stomatitis – the ulcer is often a pale yellow. The gum or tissue around them can look red, swollen and inflamed. Typically they burst within a day and there is then a thin, grey/white/yellow membrane left. The ulcer typically lasts for 7-10 days and goes without leaving any scaring or damage. An ulcer bigger than 1cm would be classed as a major or giant aphthous ulcer and you can get 1 or 2 at a time. Considerably more painful than a minor ulcer, but rarer, they last from a couple of weeks to a few month’s and make eating difficult. After they do clear scarring is more common too. Herpetiform aphthous ulcers are another fairly comment type of ulcers. Although the name implies some link to herpes, they are not. Herpetiform aphthous ulcers are just a couple of mm in width and you normally have a few at any one time. You could have as many as 100. These are rarer and can merge together to form one larger irregular looking shaped sore. They can last anything from a week to a couple of months. Sadly, life can be miserable if you suffer from these due to the associate pain and discomfort. You cannot catch aphthous mouth ulcers, they are not infectious and you are not considered contagious when you have them. If you suffer, you may get them multiple times throughout the year. Your body may change and you can grow out of them after a few years of suffering. When stressed or anxious, the immune system tends to be weakened and this can be a link to the cause of ulceration in the mouth. Poor fitting dentures or some sort of trauma to the mouth, for example caused by a toothbrush, or dental appliances such as braces have been linked to ulcers. Period cycles and the menopause can affect women become more susceptible to ulcers. Oddly, stopping smoking can cause ulcers. Missing vitamins such as B12 and folic acid may be a factor. Ensuring you are eating a healthy and balanced diet including dairy, fish and meat can be helpful as these products contain vitamin B12. Sensitivities to certain foods such as wheat have been linked with ulcers. For some lactose, and dairy proteins, or even acidic foods such as tomatoes, could all be to blame. Cutting these out from your diet could be worth considering for a period of time to see if improvements are made to the regularity of ulcers. Some families have a history of them and are genetically more likely to suffer. Some medications will cause ulceration, but they could be other types of ulcers so it is worth speaking to your doctor or dentist if you believe this is the cause. SLS is a common ingredient found within toothpaste and has been considered to trigger an ulcer. 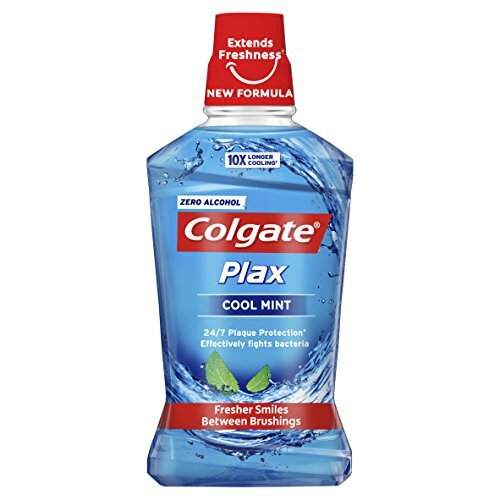 It acts as a foaming agent and can help dissolve dental plaque. All disease affects your immune system, which could cause aphthous ulcers. Crohn’s, coelic, Behcet’s disease as well as HIV/AIDS have been linked to ulceration. However, if you are you are suffering from one of these conditions, they are unlikely to be aphthous ulcers. To date there is no treatment that rids you or stops you from getting apthous ulcers, but there are treatments that can help ease pain and speed up the healing process. 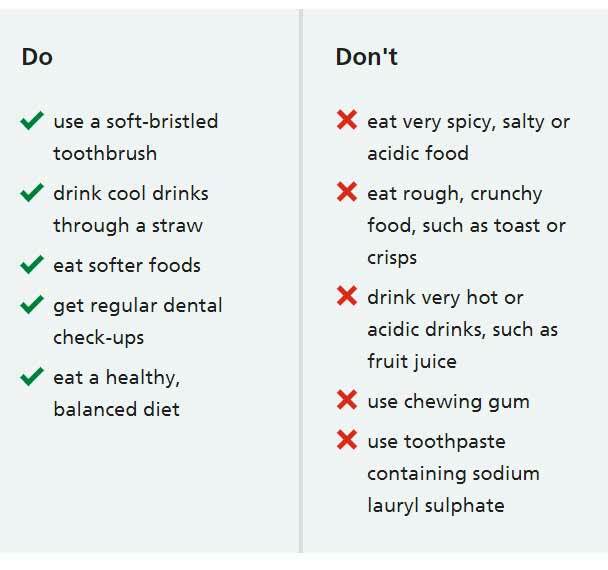 Avoiding certain foods and drinks, particularly those with a high acid, spice or salt content which can make the stinging pain feel worse. For cool drinks, a straw can be helpful to deliver the liquid to the back of the mouth/throat avoiding ulcers at the front of the mouth. 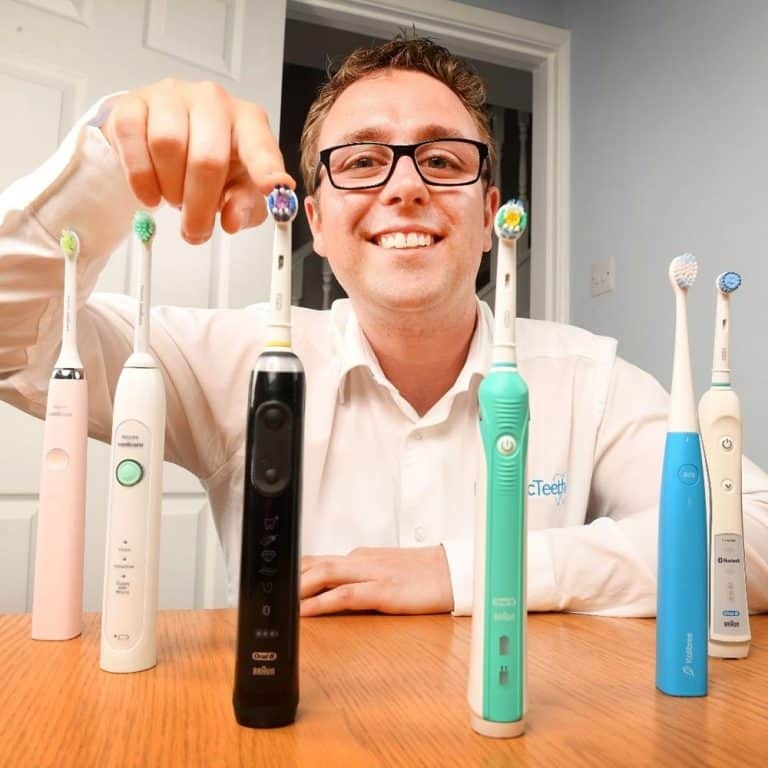 A soft bristled toothbrush will ease the pain on the gums and soft and sore tissues of the mouth. But it is important that you continue to clean your mouth as well as you can. If you believe medication is likely the cause, speak to a medical professional to consider changing the medication and approach. A saline mouthwash, like a teaspoon of salt in a glassful of warm water when swished around the mouth for a minute can be soothing and done as often as you like. Do not swallow it. There are too a number of home remedies available, I outline some of these later in this post, should you be keen to try these. The following graphic created by the NHS, is a great quick reference point. You may want something more and this is where some of the over-the-counter and off-the-shop-shelf products come into play. If you want some professional advice, speaking to a pharmacist is worth doing as a first step. They have a great knowledge of products and can easily advise something best suited to your needs. They are often quick to access in store and you need not take up the time or incur the potential cost with visiting a dentist or doctor. Some of the possible suggestions they will make will include the following products. A liquid solution or rinse for the mouth, these products can help provide a reduction in pain and sensitivity and reduce the time required to heal. GUM Rincinol mouth so rerinse is an aloe vera based formulation that helps promote the healing of aphthous ulcers, irritations from orthodontic appliances and removable dentures, and minor cuts and abrasions. It creates a thin, invisible, bioadhesive protective barrier which shields the sensitive nerve-endings from irritants such as food, drinks, braces, or dentures. Often associated with gum disease and bleeding gums the Chlorhexidine in the mouthwash is antibacterial and helps with healing more quickly. Three studies have found that chlorhexidine gel and mouthwash are more effective than placebo for reducing the duration of mouth ulceration and pain. The side effect is that this is known to stain the teeth, and change the way you taste, so is not designed to be used for longer than 2 weeks. When used, the Hydrogen Peroxide within the liquid makes contact with peroxidases and catalases (essentially bad bacteria enzymes) present in tissues (gums) and saliva, which causes the rapid release of oxygen. 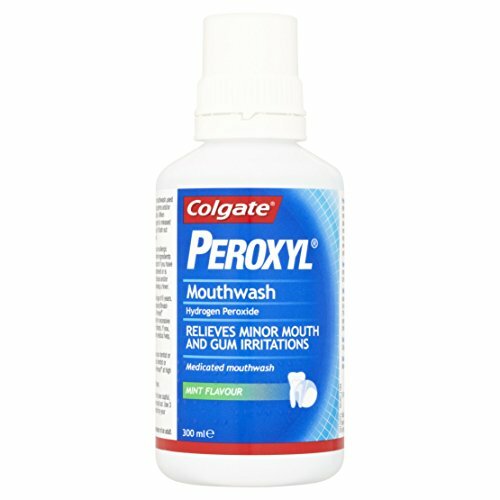 This provides mechanical cleansing which flushes out mouth debris, and helps in facilitate healing and alleviates discomfort caused by minor mouth and gum irritations, such as aphthous ulcers. Gengigel mouthrinse is unique, patented and naturally active product, suitable for most common oral conditions associated with soreness and inflammation. Gengigel stops any minor bleeding, soothes soreness and, sharp pain of ulcers and promotes healing. Dr Sarah Brewer advises that alcohol-free mouthwashes are less dehydrating and kinder to the mouth than those containing alcohol. 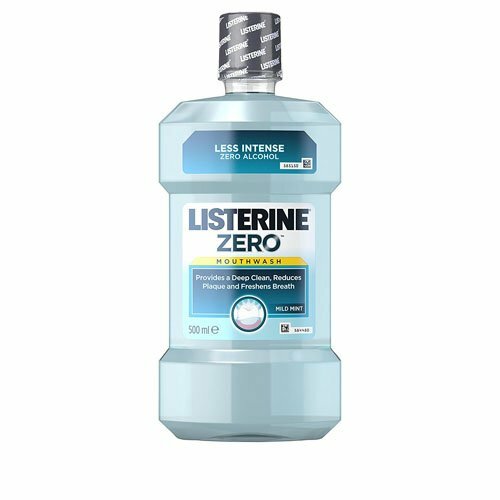 There are many different alcohol free options, but something like Colgate Plax (view on Amazon) or Listerine Mint Zero (view on Amazon) mouthwash might be a cost effective and readily available options. Applied directly to the ulcer, gels can form a barrier over the area in concern and ease pain and protect it from added sensitivity. Suitable for a ulcers and denture pain, Orajel Mouth Gel provides effective relief from mouth pain. Containing a long lasting formula orajel mouth ulcer gel is used to temporarily reduce the pain and tenderness associated with mouth ulcers. It relieves the pain by rapidly numbing the surface. Bonjela provides pain relief from mouth ulcers in just three minutes. It is specially formulated to relieve the pain associated with them and aiding the mouth healing process. Bonjela contains Cetalkonium Chloride, an antiseptic which helps to fight infections, and Choline Salicylate a non-steroidal anti-inflammatory (similar to aspirin) for the relief of pain and inflammation. 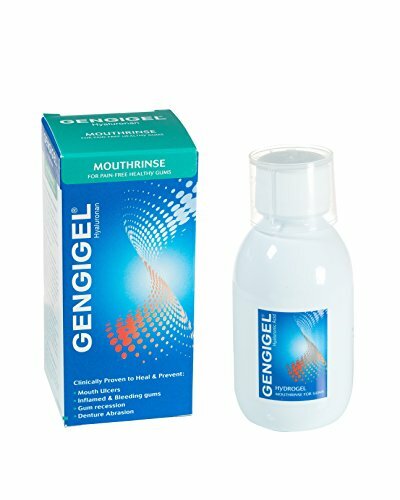 Gengigel gel is unique, patented and naturally active product, suitable for most common oral conditions associated with soreness and inflammation. Gengigel stops any minor bleeding, soothes soreness and sharp pain of ulcers and promotes healing. 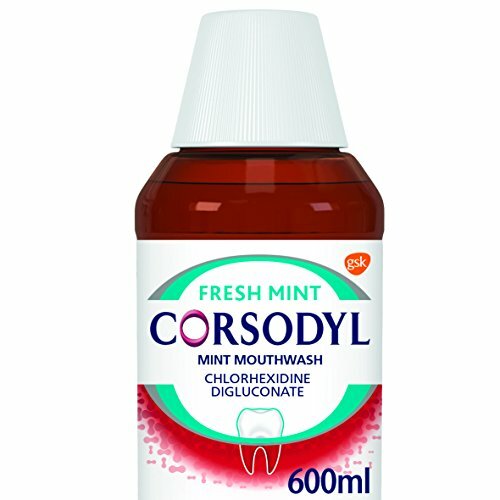 Corsodyl 1% w/w Dental Gel contains 1% Chlorhexidine Digluconate. The active ingredient, chlorhexidine digluconate acts rapidly to kill the bacteria, and forms a protective antibacterial layer over the treated area. Fast and effective relief of pain from common mouth ulcers, the product, at first looks like a pale yellow paste, forms a smooth, flexible and adhesive protective gel coating when it becomes wet on contact with saliva inside the mouth. It protects the ulcer by forming a gel coating to protect the sensitive and delicate area of the mouth lining as it heals. The actions of its two active ingredients; lidocaine hydrochloride and aminoacridine hydrochloride, which work by stopping pain (lidocaine hydrochloride is a local anaesthetic) and preventing infection (aminoacridine hydrochloride is an antiseptic). Anbesol is another gel containing the anesthetic lidocaine, which helps relieve pain. Anbesol also contains antiseptic which will protect against infection. Yet another alternative option that might be more convenient or desireable. The fine spray, when directed to the site of an aphthous ulcer or canker sore, can help relieve pain and irritation caused. Aloclair Plus can form a protective layer over the wound that occurred in the oral mucosa and protects the nerve endings that are exposed. It does not contain alcohol or create a stinging sensation when applied. The soothing pain relief can last for up to 6 hours. Suitable for children and adults, it has a very mild liquorice taste if swallowed. Other considerations, might be vitamin and steroid lozenges, but trying one or more of the above first with advice form a professional is worthwhile. There are a large number of different home remedies. These possible pain relief and ulcer healing solutions come from products we normally have in our cupboards or can easily obtain. Below are a selection of remedies that work for one person might not for another and no one remedy is guaranteed to have benefits. An alkaline, baking soda helps to neutralise the acid levels in the mouth that often irritate the ulcer or canker sore. Mix a teaspoon of baking soda in half a cup of warm water and rinse it around the mouth. Spit it out, do not swallow it. This can help kill the bacteria and help with the healing process. You have likely come across this before in other medical conditions. This natural product has soothing effects for pain relief. Take a leaf from the aloe plant and squeeze the thick gel that comes out of it onto a spoon. Using a cotton bud or swab, dry the ulcer. Use the spoon to apply the gel directly onto the ulcer. Repeat as and when you feel you need the soothing sensation. Take a sip of this solution and rinse it around the mouth for 30 seconds to a minute before spitting it out. Milk of magnesia has antacid properties, like the baking soda solution, which helps to neutralise the acidity of the mouth and in turn easing the sore. Another option is to dab the liquid directly onto the ulcer 3 or 4 times a day using the likes of a cotton bud/swab. Take a tea bag that has been used, but is cool and place it on the ulcer for up to 5 minutes. Tea is an alkaline, so it will neutralize acids that irritate the sore; tea also contains compounds that may help relieve pain. Add a teaspoon of salt to a cup of warm water and let it dissolve. Rinse this solution around the mouth for 30 seconds to a minute. The sodium chloride in the salt dries out the tissues on and around the canker sore to help with the healing process. Working to relieve pain, the use of licorice root can form a protective coating over the ulcer that will resist irritation. Soak a tablespoon of crushed licorice root into two cups of water for a couple of ours. Use is as a mouth rinse, several times a day. Using honey is supposed to keep the mouth hydrated and encourage the quicker growth of tissue that will heal and the sore. Apply honey to the ulcer several times a day. Be aware that honey contains sugars that can cause tooth decay. Dab a little coconut oil onto the ulcer several times a day using a swab or cotton bud. The coconut has oil has antimicrobial components. It is also an anti-inflammatory compound and an analgesic. These properties will reduce the swelling and pain you experience because of the mouth ulcer. The intense cold will soothe the inflammation and the pain and perhaps distract you by the thought of that is cold rather than, it hurts. Try and leave it on the spot for as long as possible. Try relaxing, resting, sleeping and generally giving yourself and your body time to heal. Reduce any stress you may have if possible. Reducing stress, anxiety and giving your body time to recuperate, rather than stretching your body further can aid in the healing process. It is not possible to say that any one thing will stop or prevent an apthous ulcer as the cause is not always known or there could be a variety of causes. However there are number of things you could do or try if you are a regular sufferer to see if the instances and outbreak of ulcers you get reduce. Seek dental assistance if you have poor fitting dentures, braces, rough fillings of teeth that are cutting or rubbing the cheeks and gums. The aphthous mouth ulcers discussed here do not normally require attention from a doctor. However, other types of ulcers can occur in the mouth and be a sign of another illness or disease. You should consider speaking to or seeing a doctor in the following circumstances. Subject to their assessment, they may suggest other treatments that are more helpful but may need to be prescribed. Examples include anything from pain killing tablets to steroid sprays and even antibiotics.